Okay, just like every other person on this planet, at least in the USA, I got drawn in again to this year’s Idol. And I must be in the minority but Taylor Hicks, an American Idol? C’mon! Katharine McPhee maybe shouldn’t have been the top pick either but she’s more of a pop star than Hicks. Let’s remember, “American Idol” is the USA version of “Pop Idol”. Are you likely to hear him on a Top 40 radio station next year at this time. I think not! Maybe you’ll hear his tune after one of Michael Bolton’s greatest (sic!) hits on some Adult Contemporary station. Another point, why’d they have both contestants sing different songs. McPhee’s tune was horrible and vocally demanding. There was no hook to it and she struggled through the entire thing. Hicks’ song was memorable and almost seemed made for his voice. Didn’t seem fair in the end. Having said all of this is Hicks’ voice or showmanship bad? No, but I’d argue the selling power of Hicks as an American Idol. What the hell was David Hasselhoff crying about? And not that there’s anything wrong with Burt Bacharach but does he have stock in the show? Do the Simon’s love him that much? It was good to see Dionne Warwick perform. Finally, something in me still loves that Kellie Pickler. Just for fun, check out “Hit Me Baby One More Time” by Britney Spears backwards! Oh and who knew that Norah Jones was in a group called “The Little Willies”? They were just on Letterman. Not a bad sound. A bad game for the Cavs. Pistons are just rolling over them! Not too much of a post but lovin’ “Charmed” on TNT! Cavs Win, Cavs Win, Cavs Win!! Well, can you believe that? The Cavs defeated the Wizards to advance to round two of the NBA Playoffs. So now, the Cavs head up to Detroit to take on the Pistons. If they get past Detroit, it’ll be a Motown Miracle. How about this Spring weather? It’s beautiful here in northern Ohio. Every tree has newly sprouted leaves and lilacs are out. I love lilacs. We had several lilac trees outside of our house as we grew up. There were a red, purple and white lilac trees in the front yard. Today, the house is gone but I don’t know about that old lilac tree. 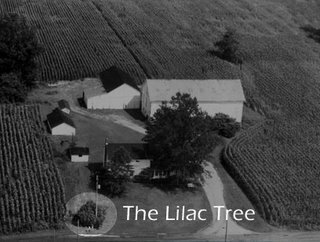 Here’s a vintage picture of the old farmhouse and the lilac tree. This is my first blog with a picture. Cool! By the way, “Family Stone” is out on DVD. It’s a comedy, that’s what the commercials would lead you to believe. You’ll laugh but there’s also some strong emotional situations that’ll have you tearing up. So just a word of warning before you sit down thinking you’re gonna get “Wedding Crashers”. It’s a little late but I just wanted to pay my personal tribute to the life of Linn Sheldon. He had a legendary career in Cleveland broadcasting. He worked at WEWS, WKYC, WUAB and other stations. He’s best known for his character “Barnaby”. I had a chance to meet him. He was a very quiet man but had quite a sense of humor. 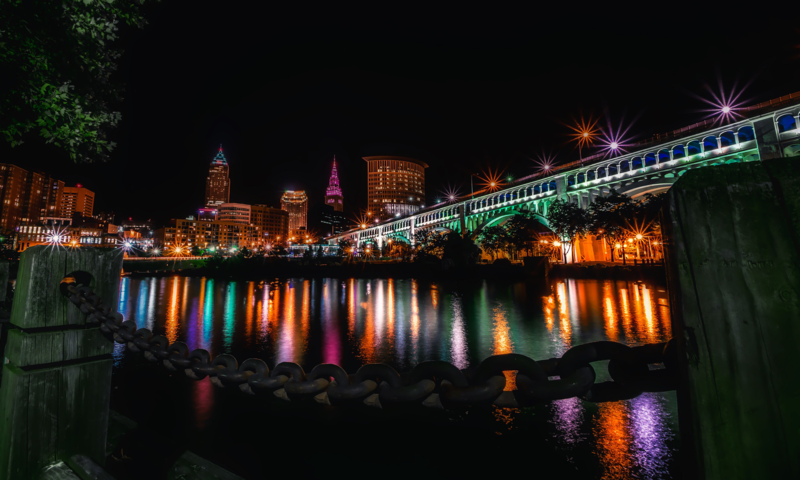 He will be missed but his contribution to Cleveland television won’t be forgotten.